Last month, innovative financial media leaders, bloggers, and podcasters gathered in Dallas at the world’s largest annual financial expo called “FinCon.” Among those in attendance was Next Avenue journalist Diane Harris, who wrote an informative piece highlighting a few of the best tips she picked up at the conference. One of her key takeaways was how important it is for consumers to leverage technology to protect their financial health, especially in the wake of the Equifax breach. Harris cited EverSafe as an important fraud prevention tool for monitoring consumers’ financial accounts—as well as their credit. Other tech services referenced by Harris included BluePrint Income, which offers a unique income annuity that will guarantee a stream of income upon retirement, and Take Command Health, which analyzes customers’ doctors and prescriptions, via a Turbo Tax—like questionnaire, and then recommends the best plans for them, both on and off the health care exchanges. 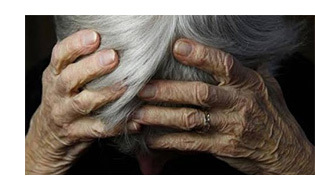 Elder abuse is now a focus of the FBI. In a recent interview, journalist Bob Sullivan shared insights from FBI Victim Specialist Debbie Deem about what to do if there is reason to believe a senior is being targeted for fraud. One important legislative development she shared: federal law now states that telemarketers cannot use Western Union, MoneyGram, or gift cards as a means of payment on phone solicitations. Consumers should be made aware that both Western Union and MoneyGram have departments where complaints relating to scams or suspicious activity can be filed. Deem also recommends contacting your state’s Adult Protective Services unit if there is evidence that a senior is being financially exploited or seems to be in trouble. You can find more information by visiting http://www.elderjustice.gov/. Finally, it always pays to educate older clients and family members about the signs of elder fraud and identity theft. Concerned consumers can report fraud to the Federal Trade Commission by visiting their website here. Mark your calendar for Tuesday, December 12th when a livestream will be available from AARP’s Caregiving Summit. Experts and industry leaders at the event will include, Sheila Marcelo, CEO of Care.com and Chief Science Officer at IBM Watson Health, Shahram Ebadollahi. 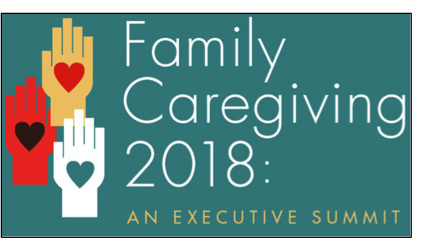 Speakers will address the topics of Policy, Technology, Work, and Community as they relate to the needs and responsibilities of America’s family caregivers. Click here to watch the event live next month. The American Bankers Association (ABA) Foundation‘s “2017 Older Americans Benchmarking Report: Findings from a Survey of Banks outlines the growing commitment of financial institutions to fight fraud and financial abuse targeting older adults. Although individuals over the age of 50 account for just a third of the U.S. population, they make up 61% of bank depositors and hold 70% of deposit balances. This makes seniors a prime target for criminal activity. The good news? According to the report, about 70% of banks now require specialized training for their frontline staff to identify suspicious activity. 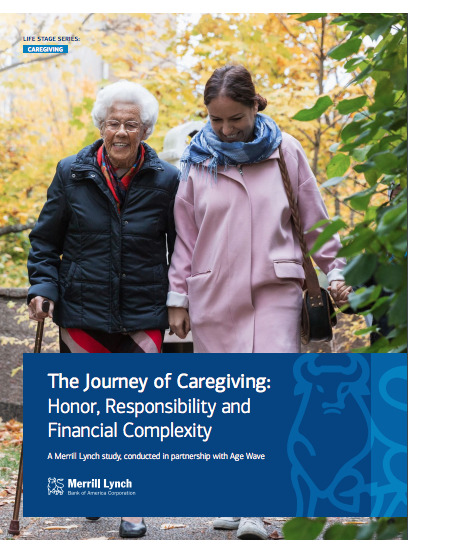 “The Journey of Caregiving: Honor, Responsibility and Financial Complexity” is another recent study published by Merrill Lynch in partnership with Age Wave. This piece focuses on a rapidly growing population of “informal caregivers” in the U.S. who have no formal training but are the primary caregiver of a friend or relative. Despite the recognition that this kind of relationship can take its toll when it comes to the health and fiscal well-being of the caregiver, 77% of survey respondents said they would “gladly” do it again. A big part of this picture are the so-called “sandwich generation” caregivers, who are also tasked with caring for their own children: 47% of adults age 40-59 are simultaneously raising children and caregiving for aging parents. Juggling multiple responsibilities can compromise the caregiver’s employment opportunities and advancement as well as the ability to save for retirement, according to the study. And caregivers who assist their older parents and adult kids in managing their money face an even bigger challenge. Using technology to keep an eye on loved ones’ finances can greatly ease this task. EverSafe’s “trusted advocate” feature is a perfect caregiving tool. Consider opting to use credit cards, as opposed to debit cards, for shopping. Credit card protection will usually limit a consumer’s liability to $50 (if there is any liability) in charges if the card is lost or stolen. This isn’t necessarily true when debit cards are used fraudulently. The Electronic Fund Transfer Act provides some protection, but consumers can lose far more than $50 and funds are pulled immediately when the card is swiped. Avoid storing credit card information online with stores where purchases are being made. If hackers breach the system of that store, private information can be compromised. In 2013, for example, the retail giant Target experienced a cyber-attack that put the private credit card information of 41 million customers at risk. Learning that one’s personal and financial data has been exposed can certainly spoil the joy of giving—so remind family members and clients to stay vigilant. The AARP has launched Operation Protect Veterans, in partnership with the U.S. Postal Inspection Service, to help loved ones identify scams targeting veterans. A recent survey by AARP found that 16% of American veterans have lost money to scams over a five-year period. For more information, and to learn how to protect the veterans in your life, visit their new website. Are you a Broker-Dealer or a registered representative of a broker/dealer firm? Then you’re probably aware that FINRA (the Financial Industry Regulatory Authority) amended Rule 4512 and implemented FINRA Rule 2165, effective February 5, 2018. This means that broker dealers, upon the opening of an account, will be required to take steps to obtain the name of a “Trusted Contact,” who may be contacted regarding issues related to those accounts. EverSafe’s exclusive Trusted Advocate feature makes it easy. We’ll take care of obtaining Trusted Contacts’ name(s) and contact information for you, ensuring they are notified. We can add fraud monitoring, with alerts to “Trusted Contacts,” if requested. Please email TrustedContact@EverSafe.com if you are interested or have questions.